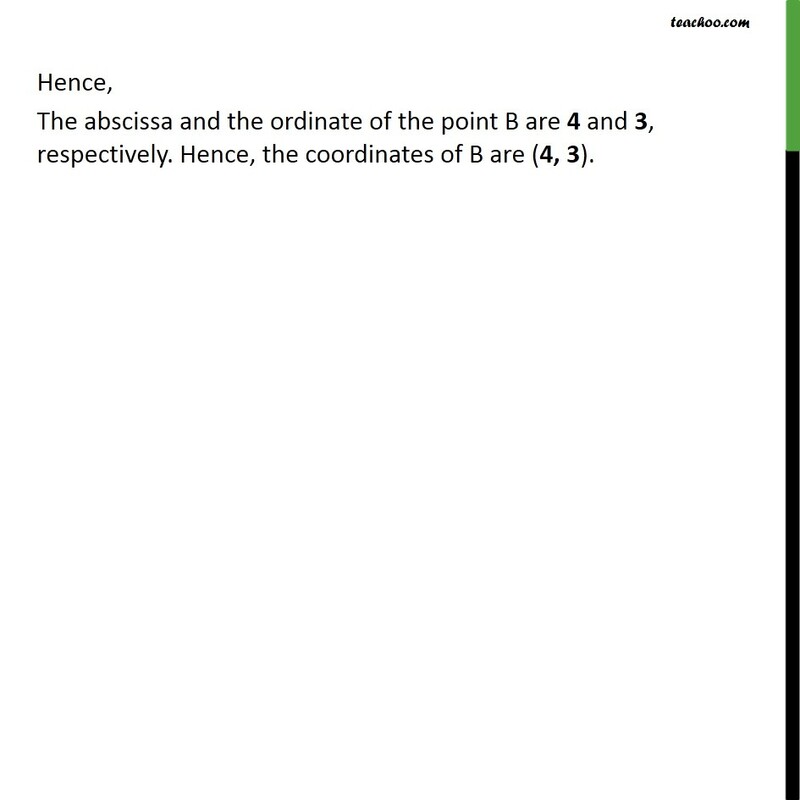 Example 1 See figure and complete the following statements: The abscissa and the ordinate of the point B are _ _ _ and _ _ _, respectively. Hence, the coordinates of B are (_ _, _ _). 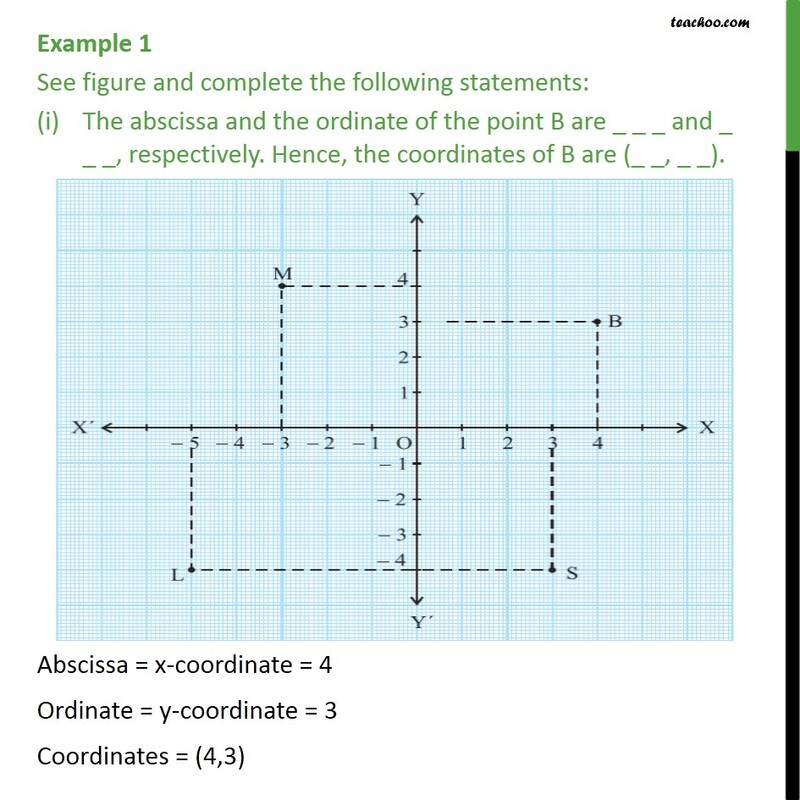 Abscissa = x-coordinate = 4 Ordinate = y-coordinate = 3 Coordinates = (4,3) Hence, The abscissa and the ordinate of the point B are 4 and 3, respectively. Hence, the coordinates of B are (4, 3). 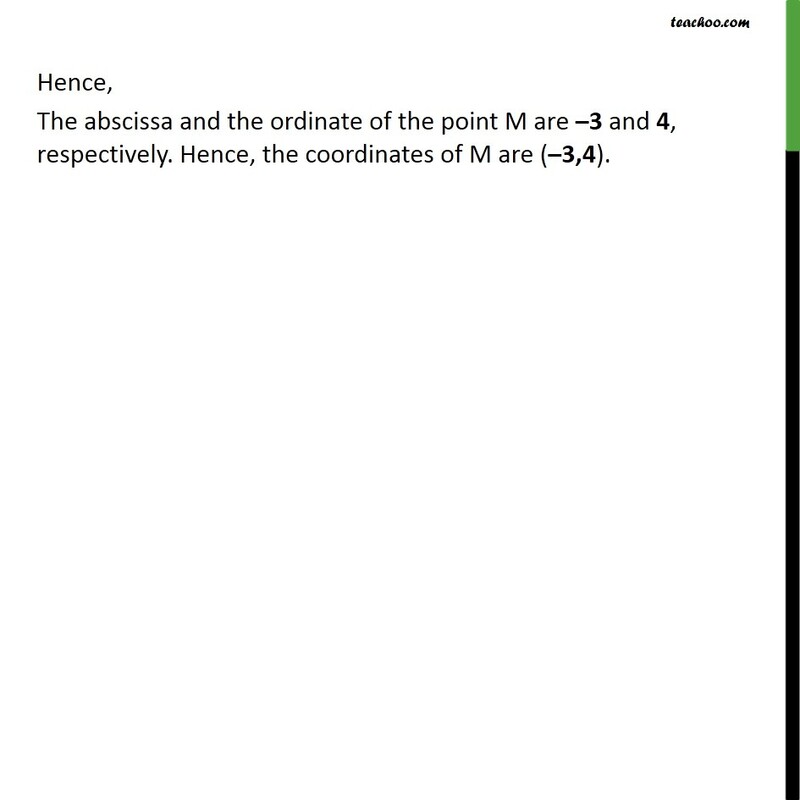 Example 1 See figure and complete the following statements: (ii) The abscissa and the ordinate of the point M are _ _ and _ _ , respectively. Hence, the coordinates of M are (_ _, _ _). 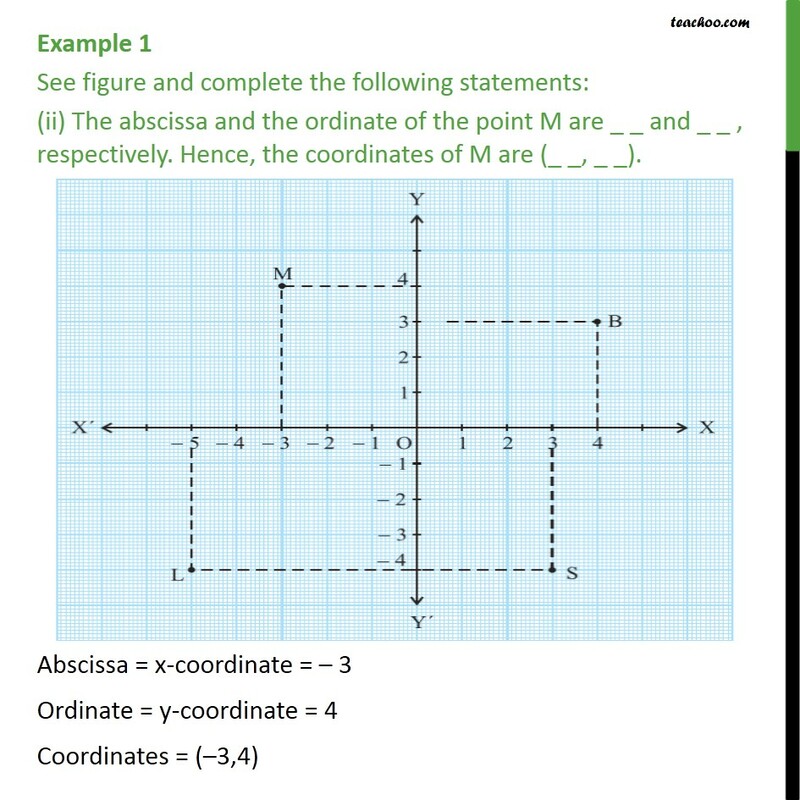 Abscissa = x-coordinate = – 3 Ordinate = y-coordinate = 4 Coordinates = (–3,4) Hence, The abscissa and the ordinate of the point M are –3 and 4, respectively. Hence, the coordinates of M are (–3,4). Example 1 See figure and complete the following statements: (iii) The abscissa and the ordinate of the point L are _ _ and _ _ , respectively. Hence, the coordinates of L are (_ _, _ _). 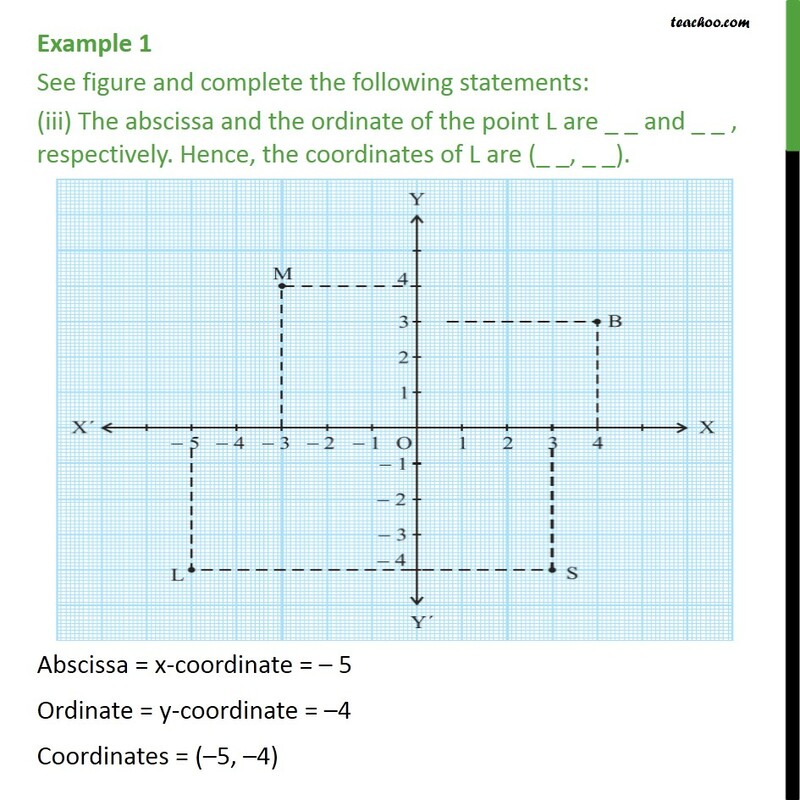 Abscissa = x-coordinate = – 5 Ordinate = y-coordinate = –4 Coordinates = (–5, –4) Hence, The abscissa and the ordinate of the point L are –5 and –4, respectively. Hence, the coordinates of L are (–5,–4). Example 1 See figure and complete the following statements: (iv) The abscissa and the ordinate of the point S are _ _ and _ _ , respectively. Hence, the coordinates of S are (_ _, _ _). Abscissa = x-coordinate = 3 Ordinate = y-coordinate = –4 Coordinates = (3, –4) Hence, The abscissa and the ordinate of the point S are 3 and –4, respectively. Hence, the coordinates of S are (3,–4).